A recent report by the arms research organization, Conflict Armament Research (CAR), says the Sudanese government continues to benefit from relatively unrestricted access to military imports despite international arms embargoes. By identifying Sudan Armed Forces (SAF) weapons captured by the rebel SPLA-N in South Kordofan State, CAR reveals that a 1994 European Union arms embargo and 2005 UN embargo remain largely ineffective. Not only does Sudan continue to import heavily from China and Russia, the report says, but it has also invested and expanded in its own domestic military production over the past decade. Sudan relies on imported military technology from several foreign countries, most notably China, to expand its own arms production via the state-owned Military Industry Corporation. Since 2014, CAR has documented Sudanese weapons and ammunition in the possession of armed groups in the Central African Republic, Libya, Mali, Niger, South Sudan, Syria, among others. The arms appear to be supplied as recently based on the new condition of the supplies. Sudan also provided massive arms reinforcement for their troops in Blue Nile last year, CAR reports, with newly acquired weapon types. The military hardware provided in Blue Nile contrasted with the older armaments recorded by CAR in South Kordofan. With military imports and production still ongoing, there is little to suggest Sudan upholds international laws prohibiting weapon shipments or plans to curb military offensives in the near future. This should be taken into consideration by the US State department who, as part of their pre-conditions for lifting nearly 20-year long economic sanctions, called on Sudan to cease hostilities in the two conflict areas. Another conditionality the state department placed for lifting sanctions requires Sudan to cease any support to rebel forces in neighboring South Sudan. 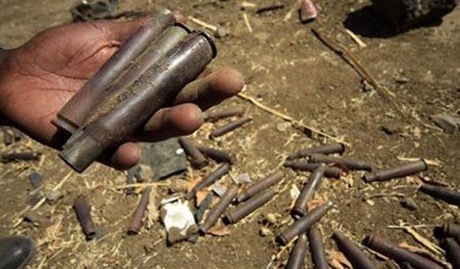 Sudan may currently be complying but this certainly was not the case last year whereby CAR identified Khartoum-supplied ammunitions in use by former Vice-President Riek Machar’s rebel group, the SPLA-IO (Sudan People’s Liberation Army – In Opposition). Assisting the state department with counter-terrorism intelligence is another criterion for lifting sanctions. There are many signs suggesting intelligence collaboration between the two countries. The CIA has set up an office in Khartoum and Sudan’s head of security, Mohamed Atta, visited Washington DC in March to meet FBI and CIA representatives. More recently, Sudan’s counter-terrorism authority claimed to have frozen bank accounts of several persons linked to terrorist activities. At the same time, CAR’s research reveals that Sudan arms have ended up in Syria, Libya, Mali, among other countries where the possibility of weapons ending up in Islamic insurgent movements is possible. The arms identified in the CAR report reveal Sudan’s shifting geopolitical relations with a significant drop of ammunitions emanating from Iran. Last year, Sudan severed ties with Iran after the execution of a Saudi Shia cleric, Nimr al-Nimr and joined Saudi Arabia’s coalition against Iranian-allied Houthi rebels in Yemen. In return, several sources have attested that the Kingdom granted at least $5 billion in military assistance to Sudan earlier this year.